The kitchen is the part of the home where meals are prepared (and may even be shared). How often do family get-togethers end up including groups of people lingering in and around the kitchen, drawn by the aroma of great food and warm conversation? This is the heart of the home, and kitchen trends are embracing the idea of opening up the space and encouraging people to come in and stay for a while. Apron-front harvest sinks are trendy for traditional-look kitchens. With their unique front appearance, they remind anyone who sees them of an old farmhouse sink. This option is striking in white but is also available in colors from different manufacturers. It’s a modern update that makes an immediate impression for homeowners who are interested in renovating their kitchen. Island work areas are a popular choice, and they can be interpreted in a number of different ways. In newer homes, the kitchen is taking up more square footage and becoming a bigger part of the home. Look for more open space instead of having it walled off as a separate room. The trend here is to have an island which is large enough for meal preparation and to allow for an eating area. Friends and family members can see each other easily, without having to move into a separate room for entertaining. Contemporary kitchens opt for quartz island countertops, with metallic accents. Quartz is as durable as granite, but has better color consistency. This means the quartz sample you see is what you get. Since granite is a natural stone, it becomes increasingly difficult to match the color and grain of the granite, in larger kitchens that have more counter space. Since entertaining in the kitchen has become more popular, this part of the home must be ready to receive visitors. Stainless steel appliances offer a clean look in the heart of the home, but some homeowners are opting to go for an integrated look where their refrigerator, freezer, and dishwasher is cleverly hidden behind door which match the rest of their kitchen cabinetry. The result is a streamlined look that is not broken up by the line of these large appliances. Eating in or near the kitchen is another popular trend. If a comfortable, convenient space is available in or near the kitchen, it makes sense to use it for family meals and snacks. A formal dining room, if one exists, would be reserved for special occasions. When it comes to seating, anything goes, from a traditional kitchen table and chair set to a large farm house table with benches. An interesting idea would be to put a pair of settees and a pedestal table in a large eat-in kitchen to create a mini-bistro appearance in a home. With the right decor, it would look absolutely marvelous! 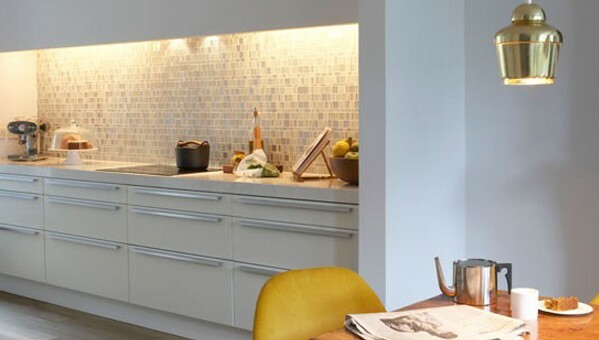 Since kitchens play such an important role in the home, they need to be well lit. Under cabinet lighting is an important trend, as consumers are spending more time in the kitchen on meal preparation and entertaining. LED lighting is a popular, environmentally-friendly choice and it is being incorporated into new kitchen designs so that homeowners are never left in the dark when they are working in the kitchen. Whether the kitchen is a traditional design or a streamlined, modern one, there is no question that is a natural gathering place for the home’s residents and guests alike. It should be a warm, welcoming environment. Current design and decorating trends are expanding its allure to make it spill over into adjoining spaces, which will only add to its appeal as the heart of the home.